Yep. In more ways than one. Yesterday was an 11 mile run. It was crappy (pun intended). I don't know what happened. I have my "pre long run" routine down pretty good and I didn't think I changed anything. After much introspection, I think it might have been a lack of hydration on Friday. I was really busy at work and I know I didn't drink as much as I have in the past. It figures. The weather was almost perfect. I'd have liked about 10 more degrees of heat but the sun was shining and the trail was perfectly dry. This week will be another story. We're expecting our coldest air of the last several years. Some mornings will be below zero. I think I have enough warm clothes. It will certainly be a trial! What do you do when your GI tract doesn't cooperate with your long run? I haven't posted much because there is nothing very earth shattering to share. Training is going even BETTER than planned. Way ahead of schedule and a better pace than I ever anticipated! Just crossing fingers than everything stays on track. The one exciting thing that happened this week is that I became a runner on Wednesday night. I started running "for real" in January of 2012. 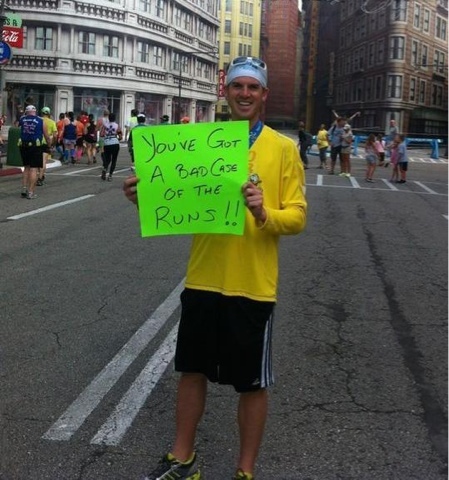 I ran 8 races in 2012. But, no matter what, I never really felt like a "runner." Not even after I ran my first half marathon. Wednesday night, Amanda and I went for our normal5 mile mid week run. About2 miles into the run, I realized I wasn't going to make it because I had to pee so badly. But the bathrooms at the park where we run are locked during the winter. I started to consider options but, really, the best I could come up with was to pee behind a tree while Amanda stood guard. I couldn't stop giggling but when all was said and done, for the first time, I actually felt like a real RUNNER! I hope I don't have to use that option again anytime soon, but now I know that if I have to, I can! Best wishes to everyone running in Disney World this weekend and I can't wait to be there in just about 6 more weeks! Saturday's run was scheduled to be 10 miles but it was unexpectedly cold, windy, snowy and icy. We were only able to finish 6 miles. Today is the first day of the new year. The first day of my 13 in 13 race challenge. I'm off to a good start! 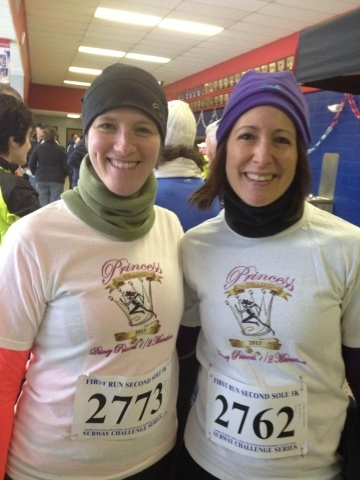 Amanda and I ran our first race of the year. 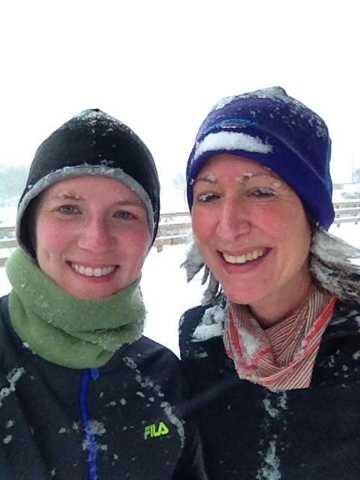 A hilly, icy, cold 5K. My time was almost 4 minutes slower than the 5K Turkey Trot in November but the weather and course conditions were partially to blame. We are still ahead of schedule for our Princess Half Marathon. Over the weekend we were able to add the dining plan tour trip for a reasonable price and today I paid off our balance. It will be here before we know it. It was, apparently, a busy "running" day today as I also registered for my 3rd half marathon for 2013 (but chronologically, it will be number2). Looking forward to our training continuing to go well. How is the beginning of our new running year shaping up?